For lack of a better term I am going to call this ceviche (hmmm, maybe pickled shrimp? No, that doesn’t sound as fun). I know that ceviche is typically raw fish and it is “cooked” when marinating in the acidity of the lemon/lime juice but we are talking about shellfish here people AND I am just a girl somewhere in the middle of America, about the furthest place possible from the ocean; I don’t really know how long that shrimp has been sitting out of the ocean. OK, so with all my justifications of cooking my shrimp feel free to eat your raw…but don’t hate me in the morning! 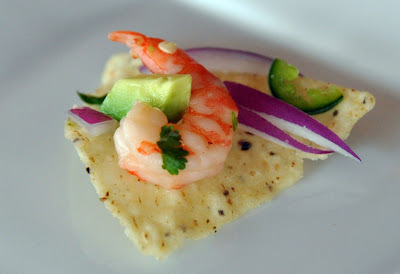 Here is my recipe for coconut shrimp ceviche…my family loves it! Bring a pot of water to a boil. Add shrimp and let boil for 1 minute. 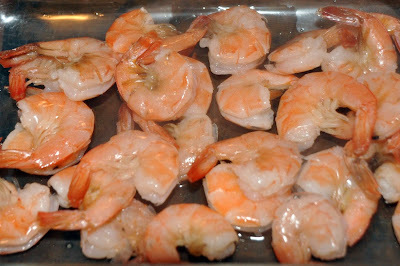 Drain the water from shrimp and cover the pot with a lid to steam shrimp for an additional 5 minutes. 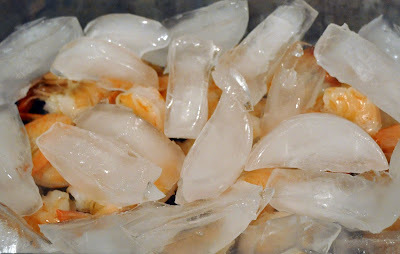 Pour shrimp in a shallow bowl and cover with ice to stop the cooking process. 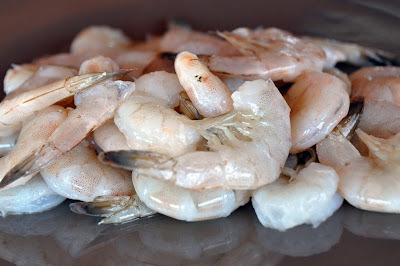 Once the shrimp have cooled, peel off shell, tail and chop into smaller pieces. If you are using small shrimp you don’t need to chop into smaller pieces. Cover shrimp with lime juice. Put in the fridge to chill. 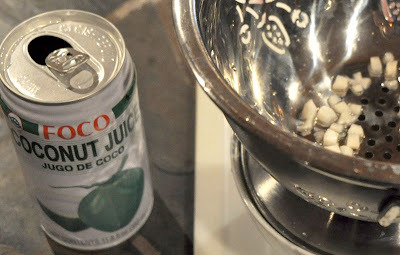 Empty the contents of the coconut juice over a colander and drain juice into a bowl (there are little chunks of coconut in the juice). 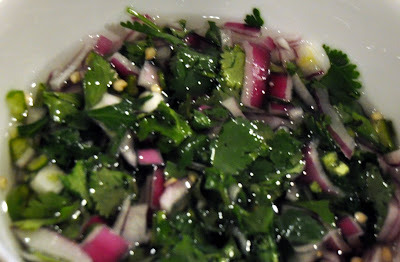 Add the tequila, onions, cilantro and jalapenos. Stir everything together and then put in fridge to chill along side the shrimp for about one hour. 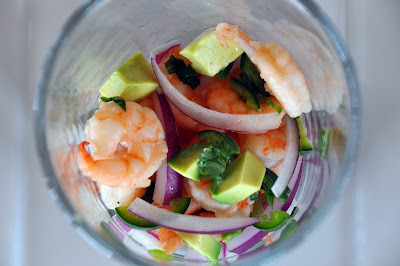 After 1 hour of "cooking"/marinating, strain the shrimp but reserve about ¼ cup of lime juice. Add the shrimp and ¼ cup of lime juice to the coconut juice mixture, combine and serve. Eat it as is or with tortilla chips. Feel free to add other ingredients to this if you want. Last time I made it I added some avocado but it wasn't quite what I was looking for...next time I am going to try adding cooked cubed sweet potato. I'll let you know how it turns out. After the ceviche is eaten, the leftover liquid is known as Tiger Milk ("leche de tigre") and is thought of as a hangover cure! I had a shrimp ceviche from a carniceria in CA that was a typical, chopped-type ceviche and I could swear that it had an element of what I thought seemed like coconut juice possibly, but was not sure. All I know is that between the luciousness of the shrimp and the essence of whatever I was detecting, I would think of sitting on a beach with palm trees swaying in the breeze. 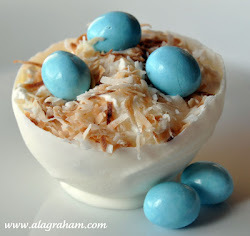 Looking for that type of thing, I was really glad to find your recipe -- it looks delicious! Could you please give me your opinion about what you find the coconut water lends to the ceviche? Thanks! Get detoxicated to solve the matter of hangover/ You will be blown away by the outcome and I can guarantee that. I have been hating drinking because of it. But after having Detoxicated I have started to enjoy my drink like I used to do. You can also know about flyby hangover supplements from their website.